I’ve been watching a couple of documentaries over Christmas, each one featuring British climbers with a mountain of achievements between them – Alan Hinkes OBE and Sir Chris Bonington. 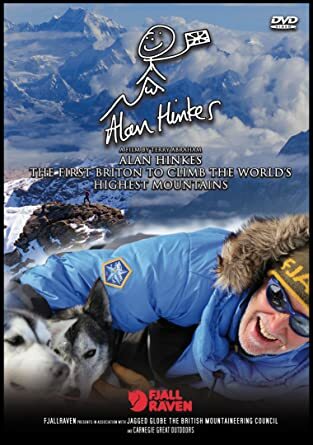 “Alan Hinkes – The first Briton to Climb the World’s Highest Mountains” is a film by Terry Abraham, whose previous award-winning documentaries about Lake District hills have been broadcast in abridged form by BBC TV. Rather than just being a straightforward account of Alan’s achievement of climbing all 14 of the world’s 8,000 metre summits, gained over 27 attempts, he’s interspersed mountain memories with people and places that had an influence on him in some way. Rosebery Topping – the little hill in Yorkshire that started it all off, and fell-running legend Joss Naylor. The film shows Alan indulging some of his passions, which include real ale and steam engines, but outdoors activities in all forms, including rock climbing, mountain biking, caving, or climbing up a waterfall. He’s extremely generous with his time helping charities such as the Duke of Edinburgh’s Award, the Swaledale Mountain Rescue team and acting as an ambassador for the Youth Hostels Association. His previous existence as a school teacher has clearly helped him in his quest to give young people a taste of adventure, and this includes his own grandchildren, who nevertheless think he’s crazy! But he makes the point that you don’t have to go to the ends of the earth to have an adventure – you can do it even on a walk in the woods. Having said that, it’s the sequences where Alan is interacting with the outdoors on a larger scale that really make the film – skipping along the classic knife-edge ridge scramble of Striding Edge on Helvellyn, being lowered into the cathedral-like subterranean expanse of Gaping Gill, or mushing huskies through the frozen wastes of the Arctic – where Terry Abraham’s talent for capturing the full grandeur of the landscape comes to the fore, along with some spectacular aerial shots. The film includes scenes shot in Nepal, including the touristy sights of Kathmandu before taking a flight to Lukla and trekking in Everest’s back yard. Here Alan reminisces about his climbs, and you realise that this bluff Yorkshireman is also very aware that he’s beaten the odds, and that he’s quite happy not to have any more big mountains on his bucket list. 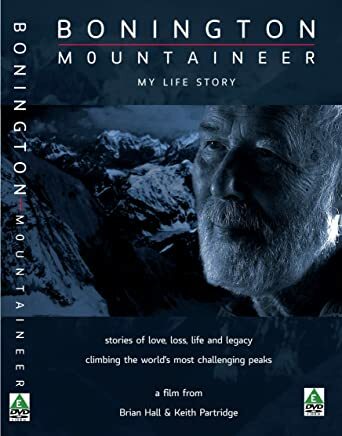 “Bonington Mountaineer – My Life Story” by Keith Partridge and Brian Hall is much more biographical, with lots of archive footage and photographs. Even so, the fact that the film opens with present-day shots of Chris Bonington recreating his ground-breaking climb on the Old Man of Hoy at the age of 80 simply leaves you open-mouthed with admiration. What fascinated me the most was the recollections of his early climbing days in the 1960s, where hemp ropes were the norm, and climbers had cigarettes dangling from their mouths – a far cry from today’s rock athletes! It was also a time when not every corner of the planet was so easily accessible by air, with an expedition to South America entailing a long sea journey. But perhaps most amazing was how after making the first ascent of Nuptse (a mountain across the Western Cwm from Everest), he drove all the way back to Chamonix to do some more climbing! Of course, this was back in the days when overlanding was popular/possible. The film features interviews with some of Chris’s climbing partners, including Doug Scott, Hamish MacInnes, Paul “Tut” Braithwaite, Jim Fotheringham and Charles Clarke, and inevitably also deals with the many friends lost along the way. Quite often these were tragedies which occurred at the moment of greatest triumph, such as Mick Burke on the 1975 Everest expedition which made the first British ascent. Impossible to choose one film over the other, as the styles are so different, but if you like mountains, and want to know what makes mountaineers tick, you’ll get a good insight from both of these. As a small digression, this seems to be an ideal moment to recount a day over 20 years ago, when, as Equipment Editor of Trail magazine, I was with a group of journalists on a product testing trip in the Lake District hosted by outdoors clothing and equipment manufacturers Berghaus. Amongst the company personnel were three of the main players in these two films – Chris Bonington, Alan Hinkes and Brian Hall. The day’s events included a hike over Great Gable, with a lunch stop by Napes Needle, a pinnacle of rock on the flank of Great Gable where the sport of rock climbing began back in Victorian times. The idea was that they would set it up so everyone that wanted to could have a go at climbing the needle. My experience at rock climbing was limited, but I was keen to have a go. Seated at the very top on belay was Brian Hall, an accomplished mountain guide who has since carved himself a career as mountain safety and logistics expert in extreme locations for the film industry, with an impressive tally of achievements including the Bond movie “Die another Day,” “Touching the Void,” “Shackleton” and “Everest.” I was on what they call in the climbing world a “tight rope.” Every inch that I moved, Brian reeled me in. Even when I reached up for some miniscule blemish on the rock which I subsequently decided I couldn’t put weight on, Brian still tightened the rope. While all this was going on, Alan Hinkes was effortlessly free climbing the rock beside, then above me, suggesting where to put my hands and feet, as well as taking pictures of me. At one point he even crossed over my back from one side of me to the other! I’m not sure how much of it was my effort getting up (it felt like a lot) or Brian’s taking a substantial amount of my weight, but I was delighted to make it to the top of this most classic of rock climbs. In order to speed things up and allow more people to attempt it, Brian lowered me down the upper pitch to a shoulder of rock where Chris Bonington was waiting to lower me down the rest of the way to the grassy slopes below. So my life has quite literally been in the hands of Britain’s best loved mountaineer. How could one possibly not dine out on that? 23,000 miles of sea, and you won't even get wet! "Confronting Poseidon" is Clive Tully's gripping story of the 10 metre RIB Spirit of Cardiff's epic voyage around the world in 2002. Click here to download. It took 30 years to write, but it can be on your Kindle or PC in seconds! "One of our Balloons is Missing" is an entertaining compilation of Clive Tully's travel stories. Click here to download. Now in a revised and expanded third edition, Clive Tully's "The A to Z Guide for Lightweight Travellers" explains how you can travel light, and stay comfortable, whether you're journeying on foot, bicycle, bus, train, boat or plane. Click here to download.